If you're looking for one of the best compact digital cameras, meet the outstanding COOLPIX P7800. Amaze yourself over and over again with breathtaking photos and Full HD 1080p videos—tack-sharp detail, rich, vibrant colours, beautifully blurred backgrounds, dramatic lighting, soft, natural skin tones and so much more. Its superb 7.1x Zoom NIKKOR ED glass lens gives you both wide-angle and telephoto capabilties and is engineered to match its extra-large 1/1.7" CMOS sensor. With an Auto Mode you can rely on, 19 Scene Modes for getting the most out of every shooting situation, creative in-camera Image Effects, complete PSAM control, RAW shooting, optional Wi-Fi® connectivity and more, the COOLPIX P7800 will go as far as you want to go. For those who never settle for second best, COOLPIX P7800 delivers. Every COOLPIX camera is built around a genuine NIKKOR glass lens, the lens in the COOLPIX P7800 is no exception. It has an f/2 maximum aperture—pros call it a "fast" lens, you'll call it incredible. Create photos and videos with tack sharp subjects against beautifully blurred backgrounds, and shoot without a flash in situations you wouldn't think possible. It has a 7.1x wide-angle to telephoto zoom range—capture 180°/360° panoramas as easily as detailed close-ups. You even can get as close as 2cm from your subject for exciting macro shots. And with lens-shift Vibration Reduction (VR), you never have to worry about a little camera shake ruining a shot. Imagine being able to shoot without a flash at weddings, concerts, parties—anywhere your flash normally fires. You won't have to interrupt a moment to capture it, and your photos and HD videos will look more natural and true to your memory. The COOLPIX P7800 performs so well in low light situations that, in most cases, using the flash is optional. Of course, when the lighting is extremely poor and you need a flash, it'll be there. Shooting conditions vary, so the COOLPIX P7800 has two viewing systems: a large 3-inch 921,000-dot Vari-angle display that swings and swivels to provide easy viewing from almost any position, plus an electronic Eye-Level viewfinder for D-SLR-style shooting. Find exciting new perspectives by swiveling out the Vari-angle display and moving the camera around—raise it overhead or move it to ground-level for suprirsing new views. When conditions require, use the bright 921,000-dot Electronic Eye-Level viewfinder and frame exactly the shot you want. The COOLPIX P7800 is so easy to use, anyone can take great photos and videos with it. Just turn the camera on, point, shoot and marvel at the results. For maximum point-and-shoot convenience, select Scene Auto Selector. It automatically optimizes the camera settings for each shot, so you'll be free to enjoy the moment while you capture it. If you want a compact camera that shoots stunning Full HD videos, the COOLPIX P7800 delivers. Full HD 1080p means exceptional video quality. Record the action, then connect to an HDTV and watch your videos come alive. A built-in mic records high-quality audio in stereo. Your videos will look and sound phenomenal. When you want to take control of exposure, the COOLPIX P7800 is ready. Select from PSAM exposure modes and the creative options will seem endless. For those who want to record the pure, unmodified versions of their photos, the COOLPIX P7800 can record in RAW (NRW) mode. Connect the optional WU-1a Wireless Adapter (sold separetely) and wirelessly transfer photos to your compatible smartphone, tablet or any compatible Wi-Fi enabled device±, control the COOLPIX P7800 and more. 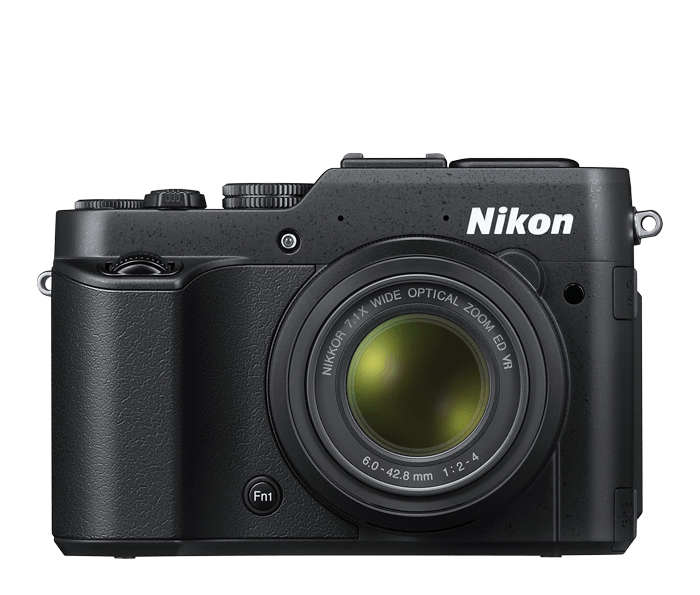 The COOLPIX P7800 includes a full-size accessory shoe that's compatible with many exciting Nikon accessories (sold separately). Take control of light with an external flash, or record ultra-high fidelity sound with an external stereo mic. Fire the camera remotely with a wireless remote control, or geotag your shots with a GPS module. You can really build a creative system around the COOLPIX P7800. Also when AF area mode is set to Manual, the AF area can be coupled to the metering range using Focus-coupled metering.